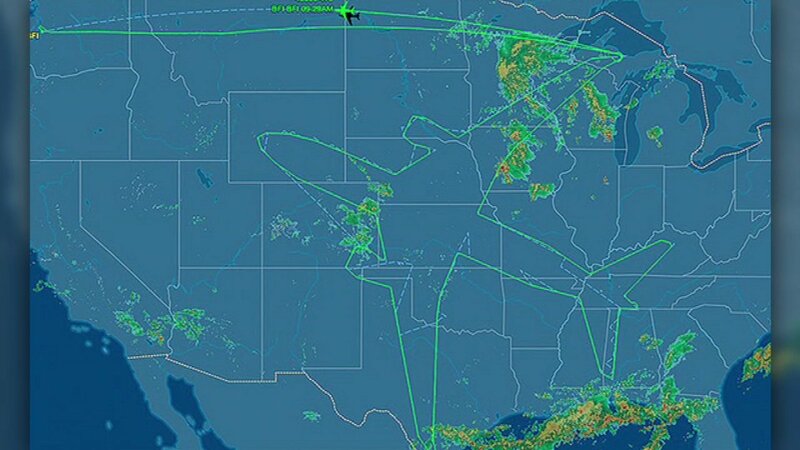 SEATTLE -- Boeing spent Wednesday evening drawing an airplane on the sky. The aerospace giant was testing an upgraded engine for its 787 Dreamliner for long endurance flights and reliability and the company had 18 hours to kill. So its flight planners designed a route that, once finished, looked like one of its Dreamliner jets. By the time it was done Thursday morning, the wingtips stretched from Michigan to Texas while its nose touched Wyoming and its tail was in Alabama. Boeing has undertaken creative flights before. Earlier in the year it traced an enormous '737 Max' over the U.S., and another time it was the company logo. Another flight took a route that flew over all 48 states in the contiguous United States.